Sport compact BoostLine rods are now available with an ARP’s Custom Age 625-Plus rod bolt upgrade. 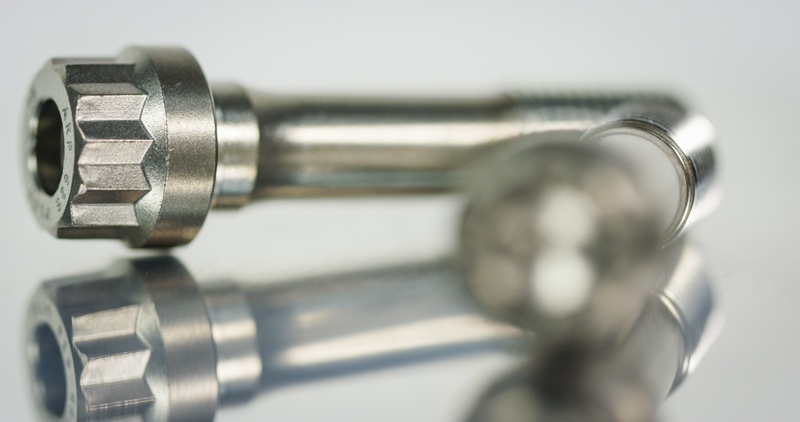 Learn about the differences in rod bolt technology. Upgrades. They seem to be a pervasive part of 21st Century life. While flying in First Class is certainly nice, it’s a trade off of personal comfort against a somewhat stiffer fare. There are also upgrades for connecting rods but instead of wine with cheese you get that added insurance of a better connecting rod bolt that that offers added peace of mind for that spinning big-block at full song. When you consider the consequences of an expired engine, the tradeoff is well worth the expense. The BoostLine connecting rods come standard with the ARP 2000 rod bolt that is already a strength improvement over ARP’s industry standard 8740 chrome moly fastener. Now for sport compact applications. They are now offering a 625 Plus upgrade. Sure, you can look up the numbers on the included chart and see that as the material quality improves, the bolts get stronger. But what do these numbers mean? Let’s dig a little deeper and come up with some answers. We can’t emphasize enough the fact that a connecting rod bolt is the most highly stressed component in an internal combustion engine. The usual talk about connecting rods centers on how the rod can stand up to the compressive cylinder pressure loads of a boosted engine. While this is an important point, it’s usually where the strength discussion ends. I-beams (or H-beams) have been used since ancient times to support compressive loads. The opposite of compressive loads are what are termed tensile loads. This is defined as the ability of a material to withstand a pulling force. In the case of a connecting rod, this pulling force focuses directly on the connecting rod bolts. Custom Age 625 Plus bolt upgrades are available for all BoostLine sport compact rods by adding a "+" behind the existing part number. So this means the connecting rod is exposed to forces or loads in both compressive and tensile directions. The highest tensile loads occur when the crankshaft yanks on the piston through the connecting rod downward across TDC during the overlap cycle. This doesn’t sound all that bad until we add the variable of rpm where the cycling of compressive and tensile loads occurs very quickly. At 7,000 rpm, the piston completes one revolution 116 times, changing direction twice. This cycles the rod with incredibly high loads in both directions. 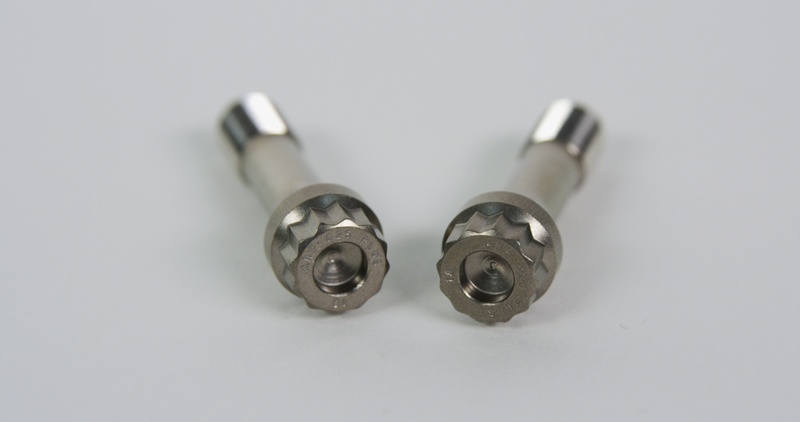 We will focus on the tensile loads here because much of that pulling force is concentrated on the rod cap and therefore the connecting rod bolts since these fasteners are the only things preventing the rod from coming apart. It’s also important to mention that while connecting rods are often rated using horsepower as an arbiter of strength, engine RPM and weight are two other major considerations. Weight and strength are often considered to be mutually beneficial but when it comes to connecting rods, lighter is better as long as strength is not compromised. As the piston crosses top dead center (TDC) and the crankshaft begins to move the piston downward, it is simultaneously attempting to pry the rod cap right off the rod. The rod bolts are the only things holding all this together. Tensile load is directly related to both mass and RPM. The g-forces that create this tensile load can be enormous. At 10,000 rpm a typical NASCAR Cup engine can experience a g-force load of over 5,800 g’s at TDC overlap. Given a typical weight of 850 grams for the piston and rod, this would put the tensile or stretching load on the connecting rod at nearly 11,000 pounds of force. That’s 11,000 pounds attempting to stretch the connecting rod bolts. It isn’t overstating the case in the least to say that extreme RPM places extreme load on the rod bolts while they simultaneously attempt to maintain big end concentricity. In the case of a 3.75-inch stroke small-block Chevy with a relatively light reciprocating package of piston and rod, at 7,000 rpm, the cap end of the rod could easily be stressed with over 7,100 pounds of tensile load. Just raise the rpm to 7,500 and the load jumps to over 8,200 pounds of force. Split that between two rod bolts and you’re looking at over 4,000 pounds of force that is attempting to rip the cap off the end of the rod. 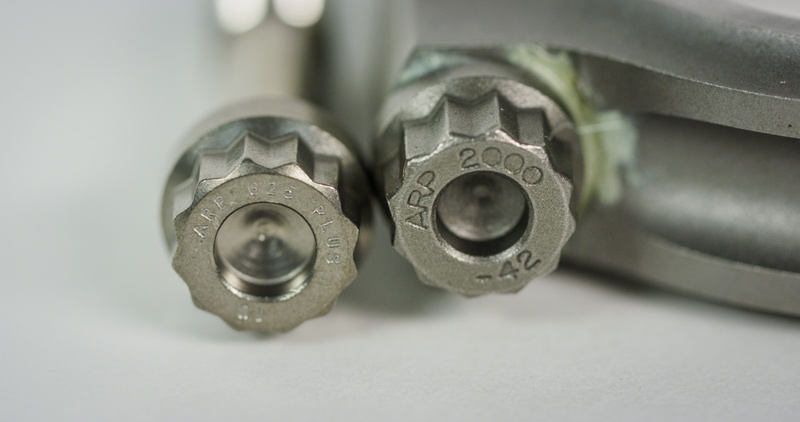 ARP's 2000-series connecting rod bolt is already a superior designed bolt. The 625 upgrade is designed for extreme case, high cylinder pressure, turbocharged engines. These numbers are not fabrications. We spoke with ARP’s Chris Brown who plugged these numbers into a proprietary program the company uses to accurately estimate connecting rod bolt fastener load values. “The RPM has a massive effect on rod bolt load. The load goes up as a square with rpm, so even a small increase in rpm results in a huge load increase.” The numbers don’t lie. All of this is taken into account when the engineers designed the BoostLine rod and why they offer not only the ARP 2000 bolt as standard but also with an upgrade to ARP’s Custom Age 625 Plus rod bolt. As you can see from the accompanying chart, while the ARP 2000 bolt offers outstanding tensile load characteristics, it is possible to improve upon these specs with the Custom Age 625 Plus bolt. Note that while the 625 Plus bolt’s absolute tensile strength does increase slightly, the yield strength is significantly greater. This allows a greater clamping load to be applied to the bolt in order to maintain big-end concentricity. But it gets better. The common misconception is that higher tensile strength automatically means the bolt is now more brittle. While that is true of some materials and heat treatments, certain materials, like Custom Age 625 Plus actually offer improvements in both tensile strength and ductility. According to Brown, Custom Age 625 Plus is a cold-worked alloy whose characteristics deliver not only a higher ultimate tensile strength, but do so with equal or better ductility. This is important because there are bending moments that occur at the parting line of the connecting rod that make the rod bolt’s ductility an important safety factor. That’s the advantage Custom Age 625 Plus bolt offers. Custom Age 625 Plus is a cold-worked alloy whose characteristics deliver not only a higher ultimate tensile strength, but do so with equal or better ductility. This is important because there are bending moments that occur at the parting line of the connecting rod that make the rod bolt’s ductility an important safety factor. That’s the advantage Custom Age 625 Plus bolt offers. Choosing this bolt also means a significant change to the validation process for the connecting rod. With a greater clamp load applied with the better bolt, this means that the stretch factor is also different, something that must be strictly adhered to both when checking bearing clearances and during final assembly. All the above reasons are why it is critical that these rods be assembled with a rod bolt stretch gauge. The process is not difficult although it does require a bit more effort compared to merely torquing bolts. Do not be tempted to take the shortcut of measuring the torque required to stretch one bolt and apply that figure to the remaining bolts. Each bolt must be individually checked for stretch and each fastener’s relaxed length should also be measured and recorded. This way, the bolt can be quickly evaluated after disassembly. BoostLine offers the ARP Custom Age 625 Plus bolt as a regular option to all sport compact applications that can be ordered simply by adding the “+” sign after the appropriate standard BoostLine rod part number. The combination of an incredibly strong rod with an equally high yield strength offers that safety margin that is necessary when pushing the performance limits of any engine. The combination of the BoostLine rod and ARP Custom Age 625 Plus bolt delivers exactly that kind of reciprocating peace of mind. All ratings are listed in pounds per square inch (psi). This information comes directly from the ARP catalog.